Armor Si is suitable for all types of plants during all stages of growth. It can be used for plants growing in hydroponics, Coco Coir and all types of media. Use as a growth enhancer with irrigation water or in addition to your regular fertilizers. 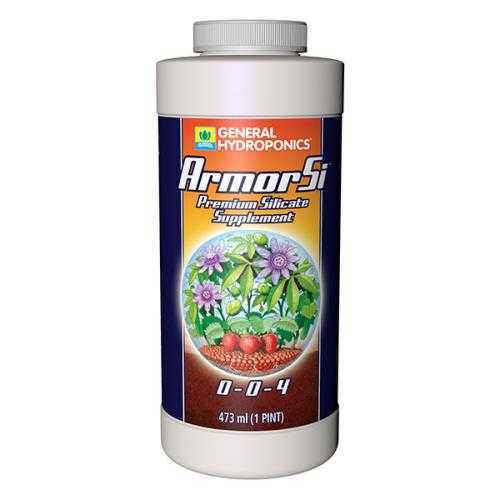 Armor Si improves plant structure and foliar development, increases yield and improves flower and fruit production. Your plants will additionally experience improved heat and cold tolerance, stress resistance, and light absorption which leads to greater plant stature. Click here for CocoTek Feedchart. Click here for FloraDuo Recirculating Feedchart. Click here for FloraDuo Drain to Waste Feedchart. Click here for FloraNova Recirculating Feedchart. Click here for FloraNova Drain to Waste Feedchart. Click here for FloraSeries Recirculating Feedchart. Click here for FloraSeries Drain to Waste Feedchart. Click here for MaxiSeries Recirculating Feedchart. Click here for MaxiSeries Drain to Waste Feedchart.